Alright, welcome to episode number six. Let me just toss out a reminder that these podcasts are cumulative, so if this is your first time joining us it’s best to start with episode number 1. Now, before getting to our review session, I’d like you to listen to and repeat this two-word phrase. Ask: Who is this? Your lawyer? Say: No. This is my dad. Now, what was that two word phrase we learned at the start? Means: Hello, I __blank__ borscht. Which means: And I __blank__ pizza. Any of these translations is fine. But of course, we need to know what we’re literally saying. And as it turns out “Я буду” means, “I will”. So you’re telling the waitress: “I will borscht.” That’s what you’re literally saying. That might sound strange to you at first — like there’s a word missing — but this is the standard way Russians will order. And of course, we do the same in English. When someone says, “Man, I’m hungry. I feel like pizza tonight,” that would actually sound strange to a foreigner, wouldn’t it? He’s thinking, You feel like pizza? You feel the way a pizza feels? In English, we also leave out the key verb. When you say, “I feel like a beer. Anyone want one?” What you really mean is, “I feel like having a beer.” Or, “I feel like drinking a beer,” right? Now there’s one other really important thing I’d like you to pick up on. Listen to how your girlfriend orders pizza. Did you hear how she said pizzU — with an “uu” sound at the end, instead of pizzA? That is an absolutely key part of Russian grammar, and it’s the real topic of today’s podcast. Vod-KU with an “uu” sound at the end. We just hear “soup”. No extra “uu” sound at the end. So what’s going on here? I know I made a big point about Russian being a rhyming language — and believe me, it is — but that’s not what’s going on here. Yes, budu does rhyme with vodku, but that’s coincidence only. What’s going on is that words that normally end in an “ah” sound — what we called feminine words in an earlier podcast — change their “ah” sound to an “uu” sound when we do something to them. Here is just a small list of what constitutes “doing something” to something. etc, etc. These all count, linguistically, as doing something to the noun. To really drive this point home, let me show you how English would sound if it had this same rule. Listen to how the word “cola” (which ends with an “ah” sound) changes in these two phrases. Do you see how we’re not doing anything to the cola in that first phrase. We’re just stating a fact: This is my cola. But in the second one, someone has done something to the cola. They drank it. So we have to say colu. There is pasta in the cupboard. Again, in that first example, we’re just stating a fact about the pasta’s location. But in the second phrase, we’ve done something to the pasta. We’ve cooked it. This is my sister Tina. Seeing Tina counts as doing something to her. Now you try it. Based on this pattern, insert the correct form of the word “sofa”…ready? Is this your new ____ ? Yes. I bought this ____ at Sears yesterday. So…Is this your new sofa? We say just sofa because we haven’t done anything to the sofa. But: I bought this sofu at Sears. Now we have to say sofu because we’ve done something to it. We bought it. If you understand this pattern, you have mastered one of the main aspects of Russian grammar. And speaking of Russian, let’s apply it now in some all-Russian sentences. We notice that the word borscht doesn’t change. You remember how we talked about creating PowerPhrases for new words, to help us remember them? It’s usually best if you think of them yourself, but from time to time I’ll make a suggestion. For spasibo, imagine buying some butter made with hot peppers. You tell the lady at the grocery store , THANK YOU for the spicy butter. See how we get THANK YOU and spasibo in there….spicy butter…spasibo. And what was that other word again? If you’re a foreigner trying to learn English, you’d be smart to master such a common construction. And if you practice the right way, you’ll quickly become fluent with that construction. If you do this for all the major constructions, and you can quickly become fluent in the language. In short: Constructions are the most efficient tool for developing fluency in a language. So, let’s practice again with our Russian construction, inserting various foods in there. Now, there’s a few main ways she might prompt you for your order. In English the waitress might say, “What can I get’chya?” ..or…”What would you like?”…or…”Are you ready to order?” and so on. And I’ll have a salad. А я буду салат, пожалуйста. Tell her: Yes. Thank you. Did you catch the word for “and”, as in borscht and a salad? So tell the waitress, I’ll have the soup and salad, please. Я буду суп и салат, пожалуйста. Hello, I’ll have a pizza and coffee, please. Здравствуйте, я буду пиццу и кофе, пожалуйста. Next time we’ll learn perhaps the two most common and useful words in Russian — beyond just Да and НЕТ. So I hope you tune in for that. I’d love to hear what you think, and how you’re doing. 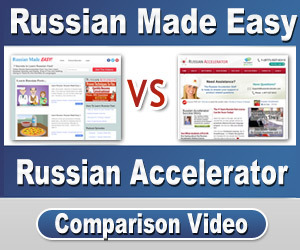 And be sure to head over to RussianMadeEasy.com for today’s downloads. See you next time. I’m doing great.I love learning Russian! Please keep up with adding more videos. Thank you so much for these great lessons. What would be very overwhelming Russian gamma constructs you manage to break down and gradually introduce with context and easy to learn cognates. After realizing the limits of only leaning Russian phrases this has really helped me out. Thanks so much. Spasibo, Fergus. Learning a 2nd language — even one as seemingly difficult as Russian — need not be hard. Thank you. These lessons are very helpful and are helping me understand Russian better than by learning just the grammar! Love it, Mark! This is extremely helpful and easy to follow. Thank you, very helpful. Your methods greatly reduce the intimidation factor that Russian has always had for me. This course is the best, easy and relaxed way for learning Russian for a mature guy like me,made me feel confident about learning everything that could probably be necessary for a short trip to Moscow, THANK YOU MARK!! Thanks so much. And I hope to see you in my Russian Accelerator course one day. I am absolutely loving your course Mark, your gift of being able to break down a language into easily understandable lessons is fantastic. So far in front of anything else I have tried. Thank you! Wow…Thanks so much for the kind words about my RME podcast. So glad you’re enjoying it. If you get the chance, it’d be great if you could leave a review wherever you came across it. And in the meantime, keep up the great work! I’m loving how easy you make it to Learn Russian. Spasiba Mark! BTW how do I say I am Portuguese (male and female) ? Она — португалка = She is a Portuguese woman. Thanks for the kind words. I hope, as you finish the podcast, you’ll join my Russian Accelerator course.